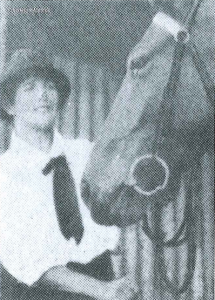 Constance Moulds (1897-1972), trotting trainer, was born on 14 February 1897 at Rylstone, New South Wales, daughter of London-born Dudley Joseph Stephens, mounted-police constable, and his Victorian wife Mary Eleanor, née Calvert. In 1908 the family moved to Rouse Hill and on leaving school Connie worked as a clerk. On 17 May 1919 she married George Francis Moulds, butcher, at Christ Church, Rouse Hill. Her only child Lawrence was born in 1923. By 1922 George was a smallgoods man at Riverstone and from 1925 a fruiterer. Although he suffered from spinal arthritis, they began to train trotters after the purchase of Tiny Loche for £30; the mare won her first three starts (which carried total prize money of six guineas) and later established a family of winners. Constance trained the horses full time, sometimes for other owners. After winning open events against all-comers at shows, in 1924 Mrs Moulds was granted by the New South Wales Trotting Club a trainer-driver licence to compete at registered meetings outside the metropolitan area. She was the only woman granted such a licence in New South Wales although there were women drivers in other States. At Richmond on 10 June she rode Chester in a rough race and finished second. A fortnight later at Menangle, she had weighed in when she was notified that she could not compete. The stewards later said that men might be inhibited by chivalry from protesting against interference by women drivers. Thereafter her racing was confined to events restricted to women. This action set back the cause for women’s participation in registered trotting in New South Wales for many years. By the early 1930s the Moulds had about twelve horses in constant work. After George was killed on the Windsor Road while driving Charming Ribbons in 1932, Mrs Moulds was ‘granted permission’ to continue training but kept only one pacer, Robert Loche, a winner on provincial tracks and at Victoria Park, and used him to pass on her knowledge and training expertise to her son Lawrie, who became a leading reinsman. In the 1940s she twice rescued a nondescript gelding, Machine Wood, from the knackery. Her kindness and gentle training were rewarded when the gelding gave Lawrie his first win at Harold Park in 1944. At the inaugural night-trotting meeting at Harold Park on 1 October 1949 Machine Wood won the New Zealand Handicap. She was soon frustrated when ordered to transfer her horses to a man before they could compete at Harold Park; so, many of her entries appeared under Lawrie’s name. Nonetheless Constance Moulds was largely responsible for training Van’s Dream and Miss Josephine, winner of the Tom Austin Cup at Richmond. At trotting meetings, her dumpy little figure was conspicuous in wide-brimmed hat and jodhpurs—she was rarely seen in a dress. She was affectionately known as ‘the little mother’ for her sympathy and practical help. Survived by her son, Constance Moulds died at Blackheath on 27 September 1972 and was buried in the Anglican cemetery at Rouse Hill. Source: Australian Dictionary of Biography, ‘Moulds, Constance (1897-1972)’, http://adb.anu.edu.au/biography/moulds-constance-7671, accessed 2 April 2016. Image: Australian Harness Racing, ‘Women in Harness Racing’, http://www.harness.org.au/hra/awards/2010/WomeninHarnessRacing.pdf, accessed 2 April 2016.